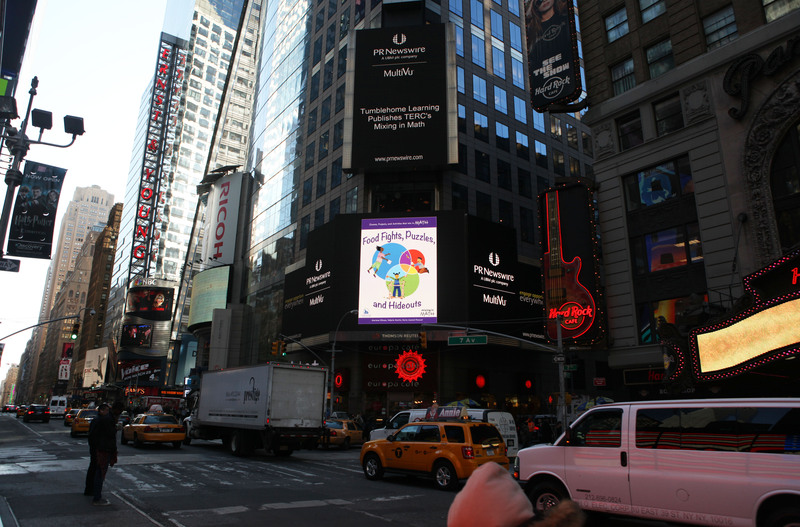 New Tumblehome Learning/’Mixing in Math’ Partnership Broadcasted in Times Square! New Tumblehome Learning/TERC partnership broadcasted over Times Square! It is indeed! Our news release on the new Tumblehome Learning/’Mixing in Math’ partnership, announced by PR Newswire, was transmitted to the Reuters Sign in Times Square multiple times Tuesday through Friday of last week. Perhaps if you spent afternoons last week in Times Square, you may have caught a glimpse of the Food Fights, Puzzles, and Hideouts book cover! So what’s this all about? Tumblehome Learning (THL), a non-traditional transmedia publishing company, has partnered with TERC to publish a ‘Mixing in Math’ suite of games and activities. Developed at TERC and based on work funded in part by the National Science Foundation*, these additions to the THL product line of science books and games include the book Food Fights, Puzzles, and Hideouts and the sets of games Jump Ship and Blockade. 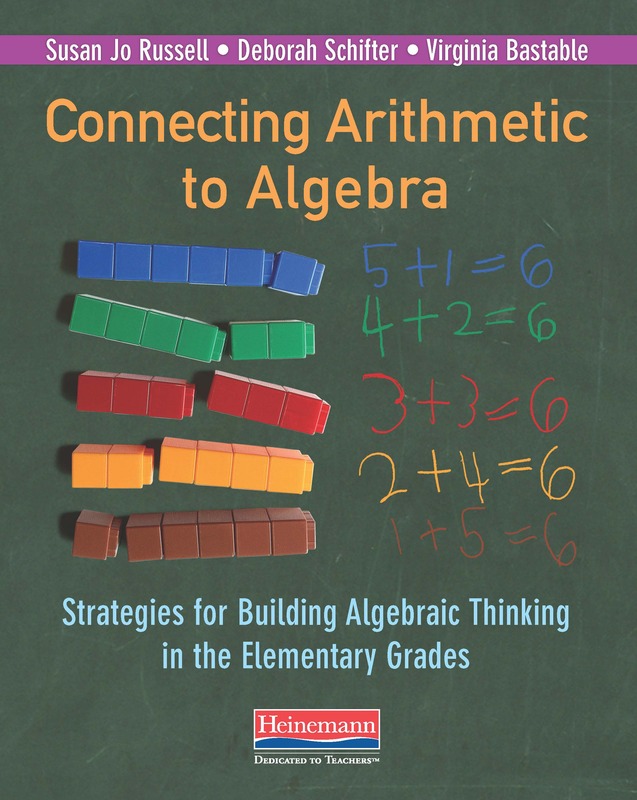 Spanning the key topics in the elementary grades’ Common Core State Standards for Mathematics, the products help parents, homeschooling families, librarians, and afterschool providers engage children ages 4-12 in the math of everyday activities. In fact, Food Fights, Puzzles and Hideouts presents hundreds of full-color interdisciplinary math games, projects, and activities that can be done at home, at after-school programs, at school, or ‘mixed in’ to car rides, snack times, and parties. With the card deck Jump Ship players get nine fast-paced games and 22 different levels of play, and Blockade packages eight dry-erase board games for 2-4 players and offers 28 game options. Want to learn more or order any of these products? Please visit the official press release, or Tumblehome Learning’s site to order any of these resources for math learning at prices of $10.95 and under. * ‘Mixing in Math’ has been funded in part by the National Science Foundation, (ESI-0406675, ESI-0714537, ESI-9901289), and has been extensively piloted with children, parents, and informal educators, including after-school providers, librarians, and family numeracy providers. Independent evaluation shows that the materials improve attitudes about math and build math skills and engagement among adults and children. ‘Mixing in Math’ Goes to Mom’s Homeroom! Click the above image of Marlene to visit Mom’s Homeroom and view the video! In fact, Marlene—along with a local family—was just featured in a new video for Mom’s Homeroom— an online resource hosted by MSN and Kellogg’s Frosted Mini Wheats—showcasing some of her favorite MiM activities for parents to easily implement into their kids’ everyday routines. Marlene shared 3 (of the roughly 200) MiM activities including Penny Jar, Soaring Towers, and Fair Shares that could be scaffolded up or down for varying age ranges (preK to 5th grade) and math comfort levels. Even better? All MiM activities are free, offered in English and Spanish, equally adaptable for classroom or informal settings, and available at: mixinginmath.terc.edu. Be sure to check them out and download your favorites—they’re kid-tested and mom/dad-approved! Linear algebra was always my mathematical strong suit—heavily relied upon, as it barely shrouded my thin quantitative undershirt. This surprised my artist mother somewhat. She had always assumed —visuospatial as I was—that I would be better matched to the more ‘creative’ study of geometry or even abstract algebra. 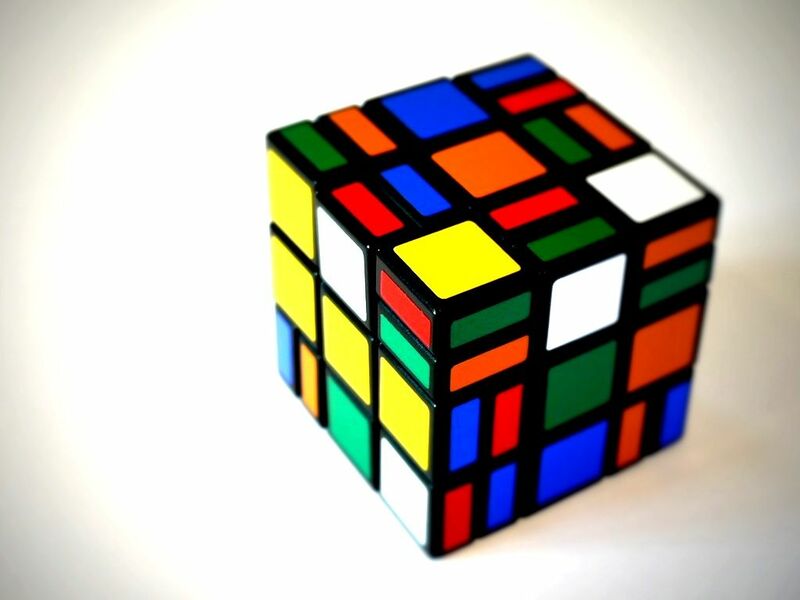 But to me, linear algebra WAS creative, in a predictably pretty sort of way—its mastery relied on using elegant variables to represent the unknown—and each composition (equation) relied on the perfect visual balance between constants and variables. Truth be told, algebra was also my mathematical weak suit—full of holes at the seams. I had struggled with math throughout elementary school and middle school, relying on iterative reasoning and memorization to get me by where true number sense failed me—and I was an “A” student. Fortunately, researchers are now investigating how early algebra can be introduced to (and understood by) elementary students to prepare them for ‘big A’-Algebra. Exploring Children’s Understanding of Functions (CUF) is one such initiative. CUF is a research collaboration between TERC and Tufts University exploring how children in grades K-2 understand functions as a context for early algebra. Project researchers have pilot tested teaching experiments among young elementary students, and have observed that K-2 graders are an optimal audience for grasping early algebra. That’s right—5-7 year olds. So what is it about these tykes that make them so good at algebraic thinking? It may be that K-2 graders don’t have a lot of mathematical baggage—that is, they don’t solve problems by relying on recursive relationships like many of their upper-elementary brethren (or, ahem, I) do. Early research observations suggest that they do not have strong aversions to or misconceptions about using variables—and seem to be equally at ease using symbolic notation (variables) and natural language to talk about math problems. And project researchers noted that the K-2nd graders in their sample were more likely to represent a function rule as an equation (e.g. R + R=V) rather than an expression using syncopated language. Wow! So perhaps 5-7 year olds can be harnessed as truly ‘creative’ algebraic thinkers in newly-pressed (but maybe slightly oversized) mathematical strong suits. That sounds like a lot fewer holes for the budding mathematicians of tomorrow!